Business Business What would it take for North Korea to join the IMF? At the recent UN General Assembly, South Korea's President Moon Jae-in was discussing North Korea's strides to build relat ions and open up to the world. 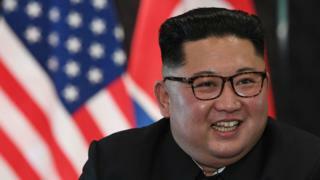 He said Kim Jong-un had even said he would be "willing to join the IMF and the World Bank and other international agencies", Reuters reported. Those ambitions, if vague for now, cast a light on the challenges North Korea will face as it tries to become part of the global economy. The country has been economically cut off from most of the world for decades because of its nuclear programme and alleged human rights abuses, and experts say the process of joining the financial bodies would be a long one. Why would the socialist "hermit" state even want to join these US-dominated institutions? Membership would give North Korea access to a huge pool of expertise, technical assistance and funds. It w ould also go a long way towards integrating it into the global economy. The IMF aims to secure financial and monetary stability, while the World Bank seeks to foster economic development and reduce poverty. Even though they have different focuses, they both seek to promote economic well-being. For the international community, bringing North Korea into the fold would appease one of the world's most dangerous hotspots. It would also give it some influence over the long-isolated but strategically positioned country. To become a member of the World Bank, which describes itself as "one of the world's largest sources of funding and knowledge for developing countries", a country must first join the IMF. And the IMF requires that member countries share information about their economies, do not restrict foreign exchange flows, pursue policies encouraging trade and pay a quota subscription. But North Korea's economy is far from transparent and it is unclear how much international scrutiny its leader, Kim Jong-un, would be willing to accept. "The economy of North Korea functions like a mafia state. There aren't any institutions as such except for the regime itself," said Anwita Basu, an analyst at the Economist Intelligence Unit. "I don't see any reason why the regime shouldn't remain secret - it's an existential thing from them," Ms Basu said. "If they reveal too much they will be weakened." Not only does North Korea not publish economic data, but it has an important black market and rampant corruption. Most people can't live off their official salaries and market activity has blossomed in recent decades. The typical North Korean household derives more than 70% of its income from market activities - both legal and illegal - according to Byung-Yeon Kim, economics professor at Seoul National University. He estimates more than half of market activities are illegal. This makes measuring its economy particularly challenging. "These market activities are quite prevalent and how to measure GDP in this kind of dual economy is a very big task," Byung-Yeon Kim said. "Even in well-developed capital economies such as Italy, it's very difficult to measure the informal economy." Corruption is also widespread among the highest echelons of North Korean power. "High ranking officials and the leader, Kim Jong-un, are likely to get a lot of money from foreign trade," Byung-Yeon Kim said. "The North Korean elites export their items [to places like China] at a lower price than the world price and then they get kickbacks which is some proportion of this gap between the world price and the recorded price for exports." It is also unclear how much economic data the North Korean government already gathers and whether they will have the means to improve this. "The DPRK [North Korea] hasn't published meaningful economic data since the 1960s," said Andray Abrahamian, Koret Fellow at Stanford University. "They'll also probably need some technical assistance on collecting that data." South Korea's central bank releases GDP figures for the North every year, based on government and intelligence service data. It says North Korea's economy saw its l owest growth rate in 20 years in 2017. Any further data is likely to shed a negative light on the regime - something the North Koreans may consider when mulling increased transparency. How about its human rights record? Movement on all of this would only be likely after North Korea has dismantled its nuclear programme and economic sanctions are lifted. But that process is taking time, with some observers saying the North is not doing enough to move towards giving up its nuclear weapons since pledging to do so at the historic Trump-Kim meeting in June. Even then, there is the question of whether North Korea's alleged human rights abuses would pose an obstacle to membership. The IMF's 2017 member list features plenty of countries with questionable human rights records, such as Myanmar and Afghanistan. The World Bank, meanwhile, has been accused of being a "human rights-free zone". "If Pyongyang can take steps to both improve some of its human rights issues and transforms its political relationships with key countries, one can imagine a number of opportunities opening up," Mr Abrahamian said. Ultimately politics will prevail when deciding whether or not North Korea could become a member. "If black markets or underdevelopments were barriers to being a part of the IMF, there wouldn't be that many members," Mr Abrahamian added. The secretary general fears disappearances like that of Jamal Khashoggi may be the "new normal".